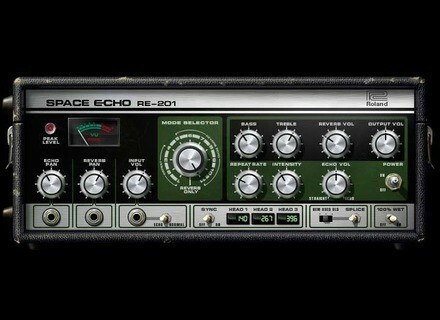 RE-201 Space Echo, Software Delay/Echo from Universal Audio in the UAD Plug-In series. loudfunk's review"The "other" famous tape delay..."
Simple purchase, unlock via downloadable authorisation file, record process to get you started. Assuming you own a UAD card. Rock solid under any platform I used it on. In 1973, Roland created the Space Echo system that utilized multiple play heads to create warm, highly adjustable echo effects, which added wonder- ful tape character and chaos to performances and recordings. The Space Echo can be heard on numerous recordings, from 70’s space rock like Pink Floyd and David Bowie, to countless Reggae and Dub albums, to more recent bands like Portishead and Radiohead. Universal Audio has been entrusted by Roland to re-create the highly beloved RE-201 unit, considered the best of the Space Echo line. Our team spent over a year developing our RE-201 Space Echo, which truly captures the physical behavior of this complex device “warts and all”, down to the distortion, wow and flutter, pitch shifting, and warmth that tape based delays are famous for; but our plug-in goes even fur- ther, capturing the complex self-oscillation that makes the Space Echo more than an effect, but a unique instrument unto itself. UA’s RE-201 Space Echo faithfully retains all the controls and features of the original, such as the Mode Selector for various head combinations, Repeat Rate for fine timing control, and Intensity which sets repeat count and allows the unit to achieve self-oscillation. The all-important Echo/Normal “Dub” switch is retained for muting, as well as the simple tone controls. Last but cer- tainly not least, the atmospheric shimmer of the Space Echo’s spring reverb is faithfully captured, putting this fantastic plug-in on par with the original unit as a tool of infinite creativity. The RE-201 is a combination of a tape echo and a spring reverb effect. Echo, reverb, or both can be se- lected with the Mode Selector to determine which ef- fect(s) are active.